“I refuse to believe that trading recipes is silly. 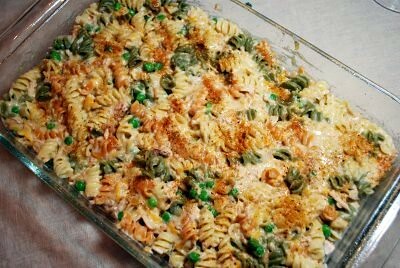 Here is my all-time favorite, old-fashioned recipe for tuna casserole. I got it from a friend back in high school, and it’s been a go-to meal for me ever since. It is wonderful the first night, but the leftovers just get better and better. Some of the ingredients may seem strange – but just trust me, dear readers, trust. Spread the mixture evenly in the prepared baking dish. Sprinkle some extra Mrs. Dash on top, if desired. Bake for 30 minutes, and remove from the oven. Sprinkle the remaining 1/2 cup of the cheese on top. Then sprinkle over that the remaining 2/3 cup french fried onions. 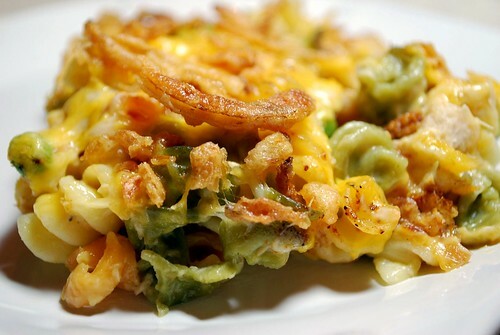 Return the dish to the oven for 5-10 minutes, until cheese is melted and onions are crispy and browned. 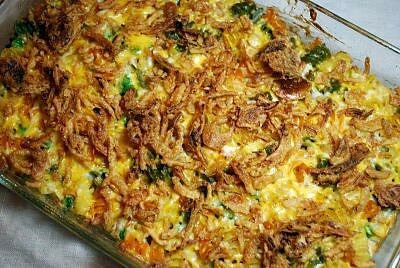 This casserole freezes well – you can freeze before or after baking it.